The World of ISSF Air Pistol Shooting is witnessing a remarkable phenomenon; Every six months or so, India appears to be producing shooting stars in both, the Air Pistol and Air Rifle shooting events. As the world watches in awe at these young stars streaking their meteoric rise through the skies, one wonders how India is producing such talent and that too shooters who are barely out of their teens. According to recent UN report, India with a burgeoning population of 356 million youngsters (between 10 – 24yrs) has the highest population of young people in the world. Shooting Icons like Olympic medal winners – Abhinav Bindra, Col. Rajyavardhan Rathore, Gagan Narang, Vijay Kumar have instilled self-belief amongst these youngsters, they believe that they too can achieve fame and glory. Most importantly, it is parents cutting across economic, social barriers who believe that Shooting is a sporting discipline where their wards can rise to Olympian heights purely on merit thereby improving their lot in society. Very often I am approached by such parents who want to know whether their child is talented or not. 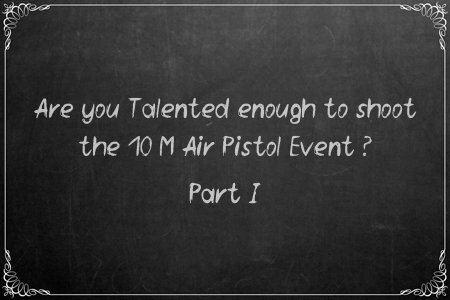 So how do you define talent in shooting? Talent is the ability to quickly adapt to the demands of the sport. And this hold true to any field or profession or calling. The ability to adapt to the demands of your vocation or field of calling. The key word is the above definition is ‘adaptability’. Shooting is a mental sport demanding very high powers of concentration. Broadly speaking, if you have the ability to ‘mentally focus your mind’ on executing a series of 60 shots perfectly or to near perfection. Then you have the talent to shoot well. ‘Perfection’ in shooting refers to perfection in ‘follow through’. And ‘follow through’ is the continuation of a sequence of steps which a shooter takes before, during and after the shot is fired, in order to shoot a ‘10’. (Centre of the target). From the above, the reader can surmise that regardless of age, height, weight, gender, economic or social background, if you have the ability to focus your mind to execute 60 records shots to near perfection, then you have the talent to excel in shooting.